See what happens when you schedule an arena show in Philly on St. Patrick's Day? Clearly the fine citizens in the City of Brotherly Love would rather spend time at Paddy's Pub puking up green brews instead of hearing Regine whistling French nonsense. Can you really blame them? 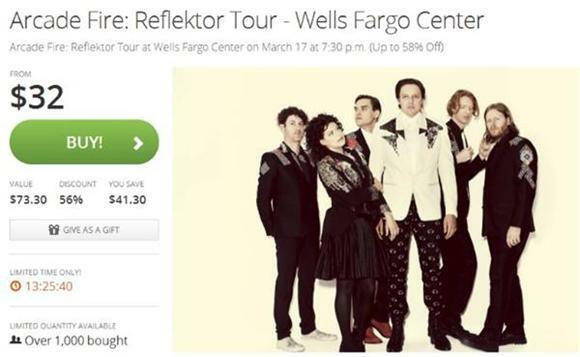 Tickets for Arcade Fire's August 23rd show at Barclays Center in Brooklyn are bottoming out at around 60 bucks. If you read the fine print on this Groupon, there are additionally Philly tickets available for 22 bucks. Interestingly, I caught Arcade Fire way back when they toured for The Suburbs at The Mann Center in Philly, and it was half-empty. Weird.